As all the veteran parents of the world crack a smile, I am finally writing again after a three-month break from the action. I can’t say there have been any breaks from the action however, as each waking moment of the day is a special gift that I treasure with my heart. My new little son Micah is the apple of my eye and has brought a joy to my life that I couldn’t have dreamed of. He is three-months-old now, and each day is better than the day before. 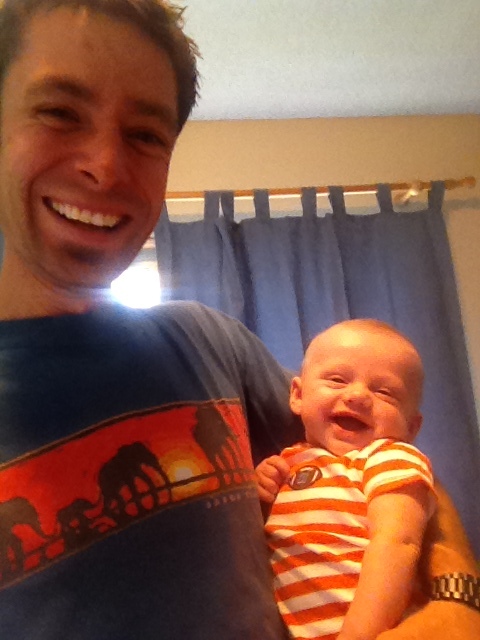 He smiles and interacts in baby babble when he sees his daddy and discovers the world around him. It is the beginning of a beautiful journey. Sitting on this side of parenthood, I finally understand how this little breathing life in front of you reorganizes everything. Like an Etch-a-Sketch shaken up after on old drawing, the sands of your own life settle down and new priorities craft a new piece of art. The things I thought would bug me about losing aspects of my own freedom do not bother me at all. Sure, flexibility and selfish spontaneity are great, but there is something that is pretty amazing about putting it aside to take care of your child. I get that now. There are a million different things that being a parent has shown me even in such a short period. One of the best things is seeing the world through a fresh set of eyes. I think sometimes children see the world as it should be. A world of colors, smiles and appreciation for just being alive. It is a simple world. As a new parent I am seeing the simple world again. It makes me smile. God has made each of us unique, and taking the time to celebrate that unique character is what makes life so beautiful. Does the clutter that makes up our adult existence really corrupt those smiles that used to come so easily when we were young? If the answer is yes, then perhaps we need to dump the clutter. I am so blessed by this new little life. I am so happy to have lost myself in the journey. I am smiling more now than I have in years. I called and spoke to my mom this morning. I told her that on the drive into town two days ago we saw a bald eagle fly over our car. It was the first time I had ever seen a bald eagle in the wild and it was one of the coolest things to see on the drive in. She went on to tell me a story about this last fall when she also saw a bald eagle fly over her house one afternoon. She has been battling Leukemia for a while now and she was having a really bad day when the eagle flew over. She told me that she knew at that point she knew it would all be OK.
My eagle sighting gave my mom chills, her story gave me chills, and God’s way of talking to us brings us all chills. God was telling us it would all be OK. We need to continue to have faith that this will all work out. 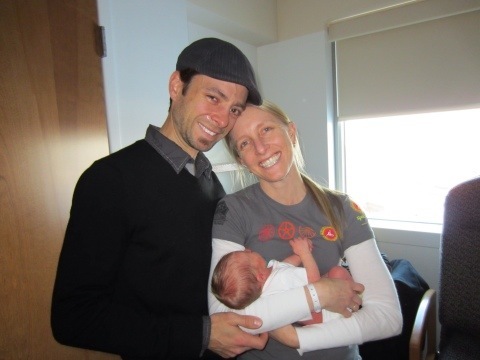 Micah Lee Barr was born on March 2nd. God answered our lifelong prayer this last week. Not always the way you think God would answer a prayer, but looking back I see His plan. It will all be OK. I thank each of my readers for your prayers. The second-hand on the clock ticks by moment by moment. Sometimes those seconds seem to slowly count down my earthly existence. Other times I find myself wishing that the second-hand would move faster and bring that amazing moment to my door that I have so eagerly been anticipating. And yet other times the second-hand seems to sit still. Frozen in time like a polar bear gazing through a thick block of ice. I know the time is near and the hours are getting short. Life is about to change. The world is about to open its arms to show us what is behind the veil. Am I ready? I feel ready. I am ready for the unknown future that awaits. I am ready for the new memories that will be etched upon my brain. I’m ready for the sleepless nights and the riches that come through seeing the world through a new set of eyes. I am ready Lord. I pray that You bring me strength and continue to bless each second. Bless the fast ones, the slow ones and all the ones in between. And most of all, bless the time that we have all been gifted with, so we can show the love You give to others and not waste it all on ourselves. This is my prayer. As I shoved the last winter sweater in my bag, I looked up to realize I still had to make room for my toiletries that were sitting in the bathroom. Somehow I always seem to underestimate the amount of baggage space I need when we go home for the holidays. The long sleeve shirts, pants and jackets try to jockey for the most comfortable position in my check-on luggage before I mash the fabric together around the bag zipper to get it shut. Like a seatbelt on a fat person, my bag zipper groans as it clenches its teeth around my precious contents. I look forward to my trips back home for the holidays. Colorado is a beautiful state, and the opportunity to change things up for some cooler weather in December is always welcome. I get excited to grab my jackets out of the closet and wear the gloves that sit dormant 11.5 months out of the year. I have lived in Southern California for 12 years now, and while it is one of the best places to live, the lack of seasons is still hard for me to get used to. Every day runs into the next like water colors dripping from a painting. It is the same day in and day out. Our winters consist of shorter days and a little rain. The summers consist of longer days and a warmer ocean. Even the Facebook posts of people who live here are the most predictable posts on the planet. “Enjoying another morning bike ride before work” and “San Diego is awesome” posts only outnumber the “I can’t believe I’m stuck here at work while my friends are surfing” posts by a small margin. Granted I can’t complain to live in San Diego. I love it here, but sometimes I miss the seasons. Just like the Colorado weather, life is full of seasons. As I look back on the hard times, the good times, life-changing times, warm times and cold times I am reminded of periods in my life that define me as a person. I know that there are definitely times I long for a life-long forecast of ‘65 degrees and sunny’, but deep down I know that the seasons are what I look back on and make me understand what life is really all about. Sometimes I have to wear a winter coat and get snowed on to appreciate the warm summer days even more. No matter what the weather is like where I live, embracing the seasons in my everyday life is an art I must continue to work on. I need to look forward to the winters, soak up the summers, and appreciate everything in between. Trust that no matter what the weather looks like, God is painting a picture, and He will keep his children close. As I am slowly stepping into my next season of life, I am excited to step outside. I am once again packing up a suitcase to prepare, but this will be a trip that lasts a lifetime. Like the Colorado seasons, I am ready for the change. How about you? Yep, 30 years later I still have a small scar above my eye. Although hardly noticeable to the untrained eye, the scar serves as a reminder that my mom knew what she was talking about. She predicted this very fate and I will have this blemish for the rest of my life. The older I get, the more signs of imperfection show up. I still have gravel in my hand from a bike crash six years ago. I have scars on my elbows from sledding accidents gone wrong. I have a white line in my finger where the knife sunk into the flesh as I played Iron Chef in the kitchen. The reminders of pain and recovery. A tattoo of life’s lessons and experiences that prove that we are mortal. While the scars on my flesh all have a story, the internal scars are more difficult to recognize. The hurtful words that someone said in a moment of passion. The rejection from the world or stories of regret plagues our minds. Each situation leaves it mark on us, and how we bounce back develops our character as people. While I have faced a few challenges recently, I have determined that my reaction to these situations will drive my recovery. Will my internal scar be a story I can look back on with strength or will it be an injury that causes my demise? I was at the market this last week and I started chatting with the clerk about an upset customer that just stormed out of the store in a rush. “For every bad thing that happens to me, I sit down and verbally say three good things that have happened to me today. It helps me keep it in perspective.” He said. I don’t want to be the sort of person that lets the scar tissue develop into bitterness. I want to be the sort of person that remembers my scars and grows from the experience. God wants to heal us, but we need to let him. In order to do that we must stay focused on what matters and what is good. Let the scabs heal. There is a saying in Colorado when you are born there that ‘you bleed orange and blue’. Denver Broncos football is in your blood from day one. Holding close to the top consecutive sell-out records in the NFL, The Denver Broncos have packed in the fans through the good times and the bad. From Barrel man to the painted faces at Mile-High, Orange Crush ‘Broncomania’ makes Colorado one of the best football states in the country. Despite all the loyal fans, it has been a while since they had something to cheer about in Denver. Since Elway took the team to back to back Super Bowl victories in the late 90’s, the team has struggled to find their way. Changes at quarterback, coaching, and the lack of ability to stay competitive has cursed the team for the last decade. Then along came Tim Tebow. The young quarterback and first-round draft pick out of Florida was the talk of the nation. I have to say that the mania that surrounds this guy is unlike anything I have ever seen in professional sports. For a guy with no tabloid stories about drunken rage, wife-beating, dog fighting or hookers, Tim Tebow has more press surrounding him than OJ Simpson. People can’t wait to blast his talent, his faith, and his existence in the NFL. The media and others have been relentless in their want to see him fail. For Colorado fans, it was a window of hope, that the team would once again be a force to contend with in the NFL. We had tried the traditional approaches to the game, and it was time to think outside the box. I don’t know many people on the face of this planet that could endure such criticism from the outside world and pull through it. What if tomorrow, every media outlet told you that you sucked at your job? The work you have done well was now not good enough– in fact, you were horrible at it. People took it one step further and blasted your character even though you are a loving and giving person. They blasted your faith, the same faith that causes you to reach out and help the homeless, give money to charity, and do good works. In fact they told you that you are a phony in all you do and you may as well jump off a bridge. Multiply that by 1,000,000 and we may have a clue what Tebow has endured from his critics. Here is what gets me about it all: Tim Tebow does not care what his critics think. He does not get his validation from his critics, coaches or anyone with a voice. He knows he is valued by God, and that God gave him a gift to be a competitor- a gift that he is using to the very best of his human ability. This gift he continues to work at each day and develop. His passion and drive to succeed comes from a want to connect his passion in a way that gives glory to something way more pure than this world could ever offer. He knows that he is not perfect. He says it all the time, but that is reality for any person, quarterback or professional on this planet. The lack of concern for the criticism of others and his strong faith make Tim a competitor. He has statistics in his first year as starting quarterback that rival the best in the NFL. His passion, drive, focus and will to succeed have led the Broncos to some of the most exciting victories the Broncos have ever won. It’s more than football. I have watched Tim this season, and I have learned from him tremendously. Tim is changing the world, I am convinced of that. Tim Tebow has inspired me to live a life every day where I am giving 110% to my job, my family and the gifts God has blessed me with. Instead of looking for validation from others, I am finding myself working to just focus on my own gifts and use those to glorify God. I am working harder than ever before. I have not been complaining so much about circumstance, and I am more fulfilled than ever before. As crazy as it sounds, I owe this inspiration to Tim Tebow. Crazy things happen when you live your life this way. You start winning games in the fourth quarter. When you think your life is over, God opens a door to give you a shot at victory. He helps guide you and direct your steps. It definitely makes life a little more exciting. It’s always going to be a battle, but in the end, wouldn’t you want something really awesome to cheer about? Thanks to Tim, not only for giving us Broncos fans something to cheer about, but for inspiring a bunch of us to live a better life that glorifies God. Many people don’t know that I have a brother. Living out in California, I am a long way from Colorado where I grew up and I am not surrounded with family. I feel that Julie and I live on our own little island at times full of palm trees, sand and surf. Our semi-annual trips back to the homeland are our only chances to interact in person with some of the people we love the most. The rest of the time, we send an occasional e-mail, talk on the phone, or use social media as our platform for feeling more connected to each other. My brother falls in the category of immediate but distant family. He is younger than I am and lives back in Colorado where we grew up. We typically got along as children although we were very different as people. Our interests outside of watching the Star Wars Trilogy over and over again were almost never the same. Although we never really connected on the same level, I rarely remember fighting as children. I think in some ways, we distanced ourselves in an effort to define our own unique identities as brothers often do. Time has passed and now that we have grown older, I feel a deep regret for not strengthening that relationship with by brother. We had a disagreement over e-mail recently that made me realize that the divide was much bigger than I ever knew. I realized for the first time that he did not respect me as an older brother. He had been hurt by things I had said in the past that I had long forgotten. He was bitter for a number of justified reasons and none of them were reasons I could reconcile. Here I was upset at a current situation, and I was in no position to give advice no matter how valid the concern. Could I be so surprised? In 32 years of his life, I had not invested the time that it takes to build a true relationship. I had been a pacifist in both friendship and in accountability. How many times to we do the same thing in our spiritual lives? We go through the motions but never really connect. We go to church on Sunday, and then expect God to be our best friend when we get in some sort of situation. We never really took the time to build the relationship, but we assumed that we were still pals with God. I’ve been thinking this past week about my host of regret. What I should and should not have done growing up. I realize that every seed we plant in life eventually grows into something. Even sometimes the lack of seeds we plant. Words of encouragement grow into strength, while neglect and insult lead to death. This applies to every relationship on Earth as well as heaven. While I can’t go back and change the past, I can look towards the future with this perspective. While I know I’m not going to get along with everyone, I do know that I can offer a word of encouragement to each person I come in contact with. It doesn’t always just ‘start’ with the little things, sometimes it ‘is’ the little things. As I continue to grow older, my family and friends are all I have, and I need to make sure the people around me know this is what I value the most. I hope that someday, I will earn the respect of my brother, but for now I will settle knowing that I have learned a valuable lesson in life about planting the right seeds. Planting those seeds takes effort. I recently read a blog from a friend of mine that took his son to the amusement park. His son was finally tall enough to ride on the roller coasters, and he could not wait to show his son the ‘roller coaster’ ropes. His anticipation as a father to watch his son’s reaction to the terrifying drops, fast twists and turns, and the thrill of the ride brought to life the memories of his own first roller coaster experience. Hopping on the first ride, his son gripped the cross-bar extra tight and clinched up in unknown expectations. Click-click-click…they ascended their first climb. The post made me think back to my own experience as a child on my first roller coaster. 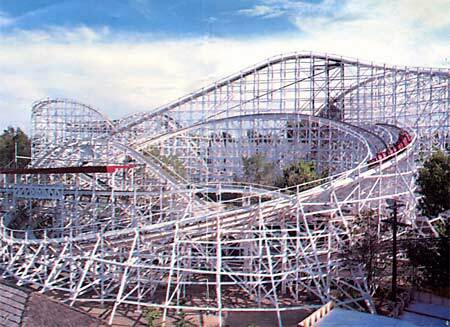 The wooden coaster in Denver called The Twister was the one that initiated me into the roller coaster world. Hopping into the cart I scooted next to my father and braced myself for action. Click-click-click….. I think I may have peed my pants that day. My dad was next to me laughing and yelling with both his hands in the air, and I was clinching the metal bar in front of me crying for dear life. I was pretty sure this would be the one ride where the cart flew from the track and I’d be done for. The cart twisted through tunnels, climbed to new heights, and meandered on the wooden tracks like a red rider wagon going downhill without brakes. We came around a bend and suddenly in front of us was the staging platform and the train came to a stop. With a smile on his face, I was positive that my father had officially lost his marbles, along with the other 200 people waiting in line to ride this thing. After I peeled my hands from the metal railing, I stumbled toward the exit, more terrified than I had been to start with. These people were crazy. Well, after some time, I grew to love roller coasters. I realized that sometimes to experience great things in life, you have to let go of your natural control mechanisms and have faith that we will survive the ordeal. The last several weeks of my life have literally been a roller coaster. I have had the biggest ups and downs of my life so far and have questioned God’s purpose in taking me on the coaster to begin with. Just like I was as a kid on my first coaster ride, I have been terrified of the next bend but hopeful that everything will be OK and we will reach the staging platform in one piece. My friend’s blog was so timely as I thought about my current situation. I am once again the child, and God is taking me down the track. I must have faith that the track is there, and that the experience will be one that I look back on and say ‘knowing what I know now, I’d do it again in a second’. I guess that’s the meaning of faith, and sometimes you just gotta throw up your hands and scream.